Your carpet stapling needs are covered with KSC''s TRAXX staples and electric stapler. Whether you need to staple the wood underlayment or carpet padding, KSC has the staples you need. These high strength steel construction staples are galvanized for protection against rust in high moisture areas and against rusting after carpet cleaning. The TRAXX 5418 Electric Stapler delivers industrial power while being lightweight and easy to maneuver even in tight spaces. Great for use in stair upholstery! Staples have high strength steel construction and are galvanized for protection against rust in high moisture areas and after carpet cleaning. Wood Underlayment Staples: 1-1/8"L x 1/4" Crown. Constructed from high strength steel that does not buckle. Designed with a chisel point to drill fully into hard birch underlayment. Clear coated to prevent bleed-through to vinyl surface. Staples have excellent holding power. Compatible with most major brand staplers including Duo-Fast® 1848 underlayment stapler. Carpet Staples: 9/16"L x 3/16" Crown designed with high strength steel that drives into hardwood stairs with ease. These staples have a tan colored crown designed to hide them even in short-nap carpeting. Staple legs diverge to provide superior holding strength. Compatible with all carpet tackers, including Duo-Fast®. Also, great for use with the TRAXX 5418 electric stapler. 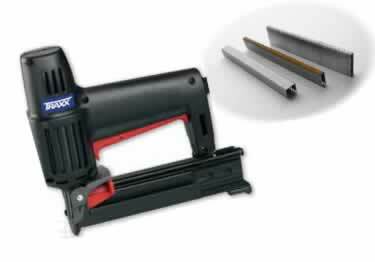 Your carpet stapling needs are covered with KSC''s TRAXX staples and electric stapler. Whether you need to staple the wood underlayment, carpet padding, are carpeting KSC has the staples you need.